Pc Clean offers Seminars for Parents on the dangers of online use by their children. These talks are given in schools and community centres to give parents a chance to find out more about Social Media sites such as Facebook and YouTube. Parents have found these talks a great insight on what their children are currently doing online. Some Testimonials from parents, teacher and principals who attended this seminar in early 2012. “Niall provided an engaging and eye-opening look inside the world of social networks for our staff and Parents Association. 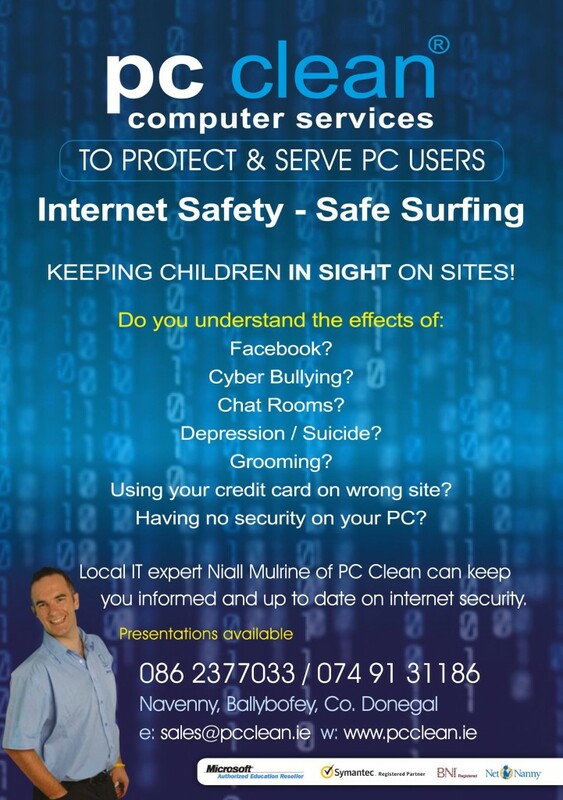 Highlighting the dangers and pitfalls associated with this online revolution helped prepare parents and teachers to protect both their own online presence and that of their children.” – Saint Eunans School teacher Pauric O’Donnell, Saint Eunan’s College, Letterkenny. Workshops for Parents is a seminar that gives parents oppurtunity to learn more about online usage of their children regarding social media sites such as Facebook, Ask.Fm, Twitter, YouTube, Mushy Monsters and many more. Where has Facebook taken our children to?